Seven years ago, I started having pain in my left shoulder. As the days passed, the discomfort grew and I could no longer ignore it. Years before, I had injured my rotator cuff, but after healing completely I hadn’t experienced much pain or discomfort in the area. So, I scheduled an appointment to see an orthopedic surgeon to explore my options. To my surprise, the doctor told me that there was nothing he could do short of an entire shoulder replacement surgery! At the age of 55, I was simultaneously disappointed, angry, and in a state of disbelief that he was unable to take a non-surgical or minimally invasive approach to relieve the discomfort. Nope. He reiterated to me that a total shoulder replacement was necessary. He then said that I would know when it was time. I left thinking that there was no way I would be having shoulder replacement surgery. For the next two years, I continued living with my discomfort. As time passed, I could not put on a shirt that buttoned up the front without pain, coats were almost impossible, and drying and brushing my hair was extremely difficult. I gave up on dresses that zippered up the back unless my wonderful husband was around to the work the zipper. Reaching for high items and completing simple yard and housework were becoming more and more challenging. The doctor was right when he said I would know when I was ready. When I returned to his office, I was very ready. I decided to have the shoulder replacement surgery so I could get dressed, take care of myself and my family, maintain my home, work, and SLEEP comfortably again. I also was interested in getting back into swimming, kayaking, hiking, and yoga again. So, I met with Dr. Tom Duquin who answered all of my questions and we scheduled surgery. He had also informed me that the osteoarthritis in my right shoulder had also progressed dramatically, so I would need the surgery done on both of my shoulders. Unfortunately, life happened and I had to postpone the surgery twice due to family issues. When it finally came time to have the surgery, I was SO ready. The only remaining question I had was: was which shoulder should be operated on first? 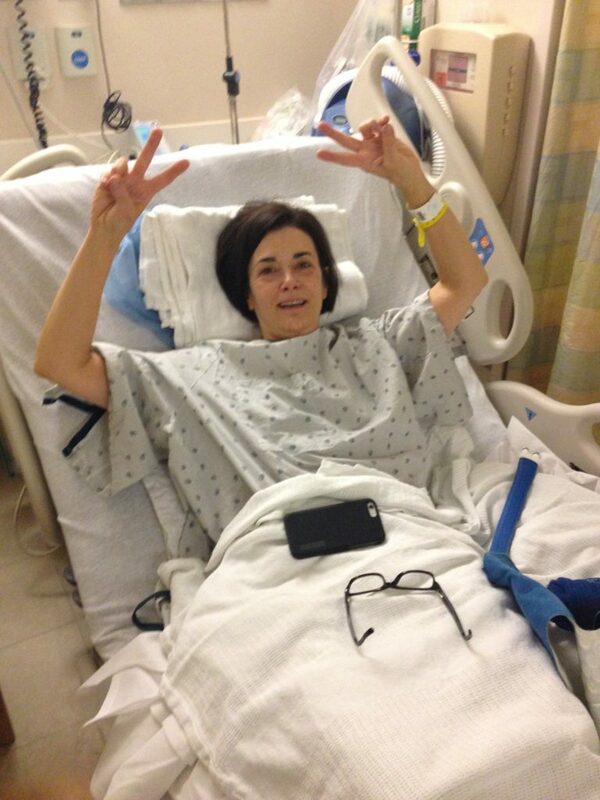 Pre operation prep for shoulder surgery, giving peace sign with both hands.